It’s more evidence that the greatest advertising campaign of all time was for…advertising. Another way to phrase Karmazin’s comment is, “the thing you need to know about the advertising business is that the people we’re selling advertisements to are basically idiots and we routinely fleece them.” And he said it to a reporter, knowing it would go into a book. It’s straight gangster. The brand is so strong that the people behind it can freely admit the con at its heart. I wonder what’s really going on here? Karmazin’s trash talk aside, it’s not like it was ever a big secret that mass-market advertising has always been a very hit or miss game. And outside of late night TV, very little of that advertising has ever been based on the idea that people see your ads and instantly get into their cars and go buy your product. It’s been about brand positioning, customer education, long-term loyalty, and so forth. So why is internet advertising so different? Why don’t advertisers accept that its benefits are largely immeasurable too? Are they blinded by the supposed precision of clickthrough rates? Or have they measured online advertising campaigns the same way they measure other kinds of advertising campaigns (measurements that are imperfect but still widely known and used) and found it wanting? 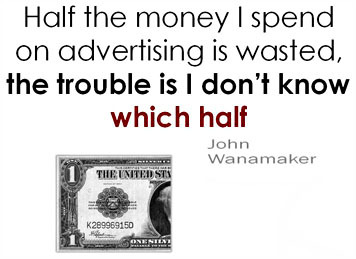 In other words, is online advertising genuinely less effective? Or does it just seem less effective because of the most common metric used to evaluate it? I imagine this is something that’s been studied in some depth, but if it has been, it’s odd that I almost never see anything about this in the non-trade press. What’s the deal?